A small group, secluded unique waterfall hike - into off beach lush canopied raw nature dirt paths - for an intimate mindful connection with the real Hawaii- no other group tour take people to Oahu's best most pristine waterfall you can actually lay in - Starts w/ beachfront yoga under a grand banyon tree. Serene yet invigorating & adventurous. Beginners & all levels. Our consistent 5 star reviews is your assurance we provide the premium unique experience we dedicate ourselves towards - many saying it was "the best thing they did while in Hawaii", and a "must do if you like adventure and not the typical tourist pitfalls and crowds". If you want to see Oahu's best waterfall that you can actually lay in, we are the only group excursion that will bring you away from commercially developed waterfalls - into Oahu's most stunning hidden areas to experience the real Hawaii locals cherish. 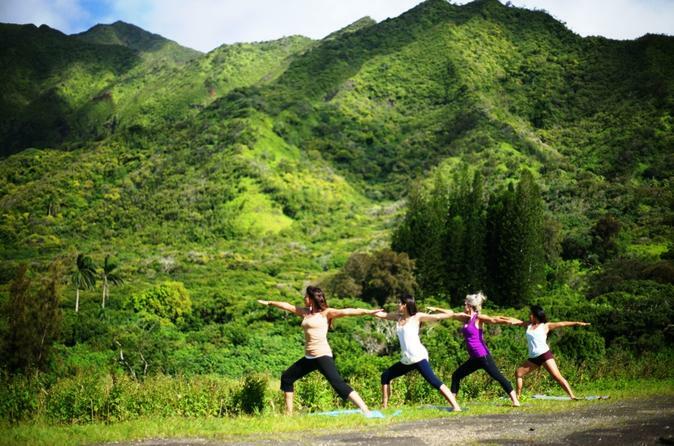 Areas that tour buses cannot bring a mass of people, but because our mission is in spreading mindfulness ...our aim is help people discover and learn about the wonders inherent in raw nature- a true connection with Hawaii's land and culture. We keep our groups small, bringing you into wild nature for an optimum, unique experience; as a local grassroots endeavor with a mission, our focus is to offer the most enriching experiences rather then just bringing the most people. Unlike other tours, we customize the waterfall path that day in accordance to the best water flows - so you never encounter a day where the waterfall you get to has no water that day. Manoa Falls is an option if you request specifically in advance, although due to the fact that you can not get close to Manoa falls (it is roped off and prohibited) and the shoulder to shoulder crowds at both Manoa and Waimea falls, our guests feel privileged to be able to access the more hidden falls within Manoa Falls and Pali Areas- Oahu's local favorite areas surrounded by lush canopied fauna unpaved paths into waterfalls where you can actually lay within crystal clear waters and no one else will likely be in your photos. We love to show travelers interested in genuine connections to Hawaii- these rugged hidden gems where locals rest and play - the real Hawaii locals love to share with travelers that will take time to relax and really see. Hike follows the morning Beach Yoga on Waikiki/Daimondhead area and meditation by the waterfall ad small bits of yoga in the jungle. the yoga class is from 9am-10:15 and is optional but included at no charge. If you have particularly high energy- we do recommend joining this beach yoga option. Hike portion: This roughly 3-4 hour easy to moderate hike follows after our full morning beach yoga session -Perfect for folks brand new to yoga/hiking. With driving time- add an hour to this.